Yesterday I removed the rear bumper from My Truck in preperation for the creation and attachment of My Custom Rear Bumper. The actual removal of the bumper was the easy part. The hard part was what to do about the turn signals. 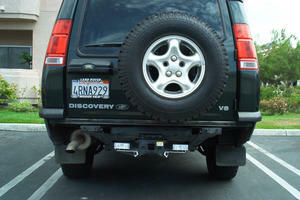 You see, for some dumb reason, Land Rover put the turn signals on the bumper, and the break/reverse lights on the rear collumn. This makes the reverse lights ineffective at seeing the ground behind you when reversing, and it makes the turn signals hard to see. So, what I did, was to mount some aftermarket reverse lights to the trailer hitch, and put some orange bulbs into the sockets for the reverse lights, then got all the wires going to the right places. So now, as it should be, my reverse lights are bright, and near the ground, and my turn signals are bright, ant at eye-level. AND... The bumper is removed, making temporary fitting of my new bumper during construction much easer. Matt Bell (2002-07-10): Wow! Are you doing the welding and everything? C. Alexander Leigh (2007-04-23): To pass the UK/EU equivlant of DOT, the primary brake and turn signals must be visible when the doors are open on the car. LR didn't realize until too-late in the design process that opening the rear door blocks the right light (which would have been traffic-side in the UK). So, on the Disco-1 they duplicated both the brake and turn lights on the bumper and the pillars. This turned into a trademark look that they mostly keep for the history of it.